This stellar treatment detoxifies, hydrates and restores dry and parched hair. Perfect addition to any service, especially a Wash & Go, Curly Cut or DevaCut™ to ensure your curls are at their maximum, juiciest potential. More than one treatment may be needed to fully remove build-up. Please note: This service does not take the place of at- home detox for our curly cuts. *This is an add- on to a Full Service and should not be booked alone. Used to permanently strengthen hair that has been damaged bychemicals (color/ relaxers) by linking together broken disulfide bonds. These bonds, responsible for 60% of the hair's strength, break when excessive heat or chemicals reach the cortex of the hair. Olaplex is a permanent bond connector; the more it's used the more it rebuilds and strengthens the hair. CURLS. ARE. OUR. PASSION! Whether you want 1/2" off, desire a little shaping, or want to do the Big Chop, we offer our signature Curly Cut and the DevaCut™, and are able to utilize a number of methods for cutting your Wavy, Curly, or Coily hair. Your stylist will design and customize a curly hair cut especially for you. Your curls are safe and will be loved while in our care. *If your curl pattern has been altered by heat styling tools, please schedule with Leah Register. Preparation instructions for this appointment can be found here. Don't want to prep? Book a Curl Discovery Session with Curly Cut. Hair is botanically cleansed, deep conditioned, softly blown dry, and trimmed. Perfect for the client that desires a professional deep condition and trim, but prefers styling themselves, or as prep for braids. This service does not include styling of any kind. Performed on freshly cleansed, blown dry, or straightened hair. A Trim refreshes and oxygenates your ends, but does not provide shape. A Cut provides shape. *This service is an add-on to a styling service that includes a blow dry and cannot be booked alone. Are you 100% natural and have only worn your hair in protective styles? Do you want to wear your hair CURLY, but have no clue how to get there? Included with this service is a Curl Detox, Curl Definition Lesson, Wash & Go, and customized product recommendation to maintain the look at home. Need shaping too? Book for a Curl Discovery Session with Curly Cut. Natural hair is botanically cleansed, conditioned, softly blown dry, then sections of hair are twisted together, allowed to dry, then unraveled to reveal a Twist Out. Minimum length is 4". Natural hair is botanically cleansed, conditioned, sleekly blown dry, and sculpted and secured to reveal an updo. Great for formal or special events. Minimum length is 6". Natural hair is botanically cleansed, conditioned, and while wet, a small comb is used to create coils. This is a popular, maintenance- free style. Great for short hair. Unravel in a week or two to reveal a Coil Out. 4" maximum hair length. Natural hair is botanically cleansed, conditioned, then set on traditional or flexi- rods, and after drying, curls are carefully separated for volume and fullness. Minimum length is 5". Natural hair is botanically cleansed, conditioned, and wet or blown dry hair is two strand twisted. 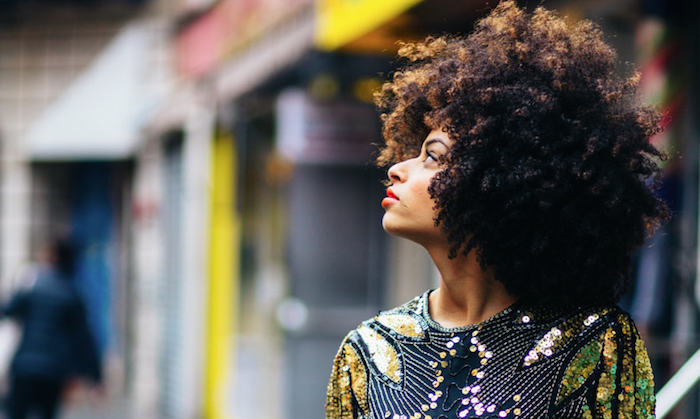 Unravel after a week or two to reveal a Twist Out. Minimum length is 4". Natural hair is botanically cleansed, conditioned, sleekly blown dry, straightened and loosely curled. Avoid humidity to prevent frizziness. Minimum length is 5". All color services must be booked through the salon directly and are not offered through online booking. Please be sure to complete our Color Consultation Form prior to contacting us for an appointment for hair color. Necessary if you are interested in having your current hair color fixed or corrected. Price varies depending on the complexity of the correction. This can be a multi- step process. Online booking not available for this service. Please call the salon for more information and/ or to schedule this service. Removes artificial and undesired pigment from hair in preparation for a new color service. This service sets the foundation for beautiful hair color with even and consistent results. Single process color is all over color that can be used to cover gray, darken (previously colored or virgin hair) or lighten (virgin) hair up to 4 levels. For previously colored hair (even a rinse), please add a Hair Color Extractor service when booking. Add- on service that protects the hair cuticle and adds longevity to your fresh hair color by prolonging inevitable fading. A Hair Glossing Treatment can also neutralize unwanted brassiness, or refresh faded red tones. A highlighting technique developed by Diaspora Salon in which color or lightener is painted on various mid- lenghs and ends of hair. The result is fresh color that looks "lived in" and doesn't need to be retouched. This is our most popular highlighting service. Highlights add dimension to your hair. We offer a number of different highlighting techniques, including traditional foiling and balayage highlights- highlights gently swept that don’t need to be retouched often. Pintura Highlighting is a technique created by DevaCurl™, and is the process of painting curls individually. Pintura Highlighting helps create light reflecting, natural looking highlights that work to boost the hair’s brilliance and dimension. These are two- step process; hair is safely lightened in one or two appointments, then toned to create the desired results. Please call the salon for more information and/ or to schedule this service.